On behalf of the women of my country, the Philippines, and the 15 other countries currently participating in the crafting of a new regional free trade agreement, let me start, distinguished negotiators for the Regional Comprehensive Economic Partnership, by reminding you that the lives of 3.5 billion women and men in the Asia-Pacific region is at stake here. Whether the lives of this generation of our people, and the generations after us, will veer towards joy or misery, take a path of development or greater poverty, is tactically in your hands. What do women of the region know of the RCEP? We boldly say: Nothing and everything. Nothing, for the obvious reason that every important agenda, every dealings and wheelings in the eight rounds of negotiations, has been kept secret from the very people who will bear the brunt of the outcome of this trade deal. But as far as we know of the objectives of the RCEP to consolidate the region and further advance economic liberalization, to set uniform rules on investments, migration, intellectual property, dispute settlement and investment protection, we know everything about the RCEP. Insofar as the RCEP is pushing for economic liberalization, privatization of public services, market deregulation and denationalization—policies which have brought upon women intensifying poverty, joblesness, food insecurity, and the overall disempowerment of half of humankind—we know everything about the RCEP. To women, the RCEP will further decimate local national industries. Factories and export processing zones that turn out consumer items for re-export will be given free trade incentives including repression of wages and labor rights, local taxpayer subsidies for foreign investors and tax breaks for big business. Women who flock to these production zones are mercilessly exploited with long hours of temporary and home-based employment and hazardous and unhealthy working conditions. The fate of hundreds of women workers reportedly burned in a Japanese-Singaporean owned factory in an export processing zone in the Philippines, the difficult struggle of factory workers in Cambodia, Indonesia, the Philippines and Vietnam for higher wages and against precarious work are living proof of the ills of a system where governments prioritize privileges of foreign investors over workers’ rights. 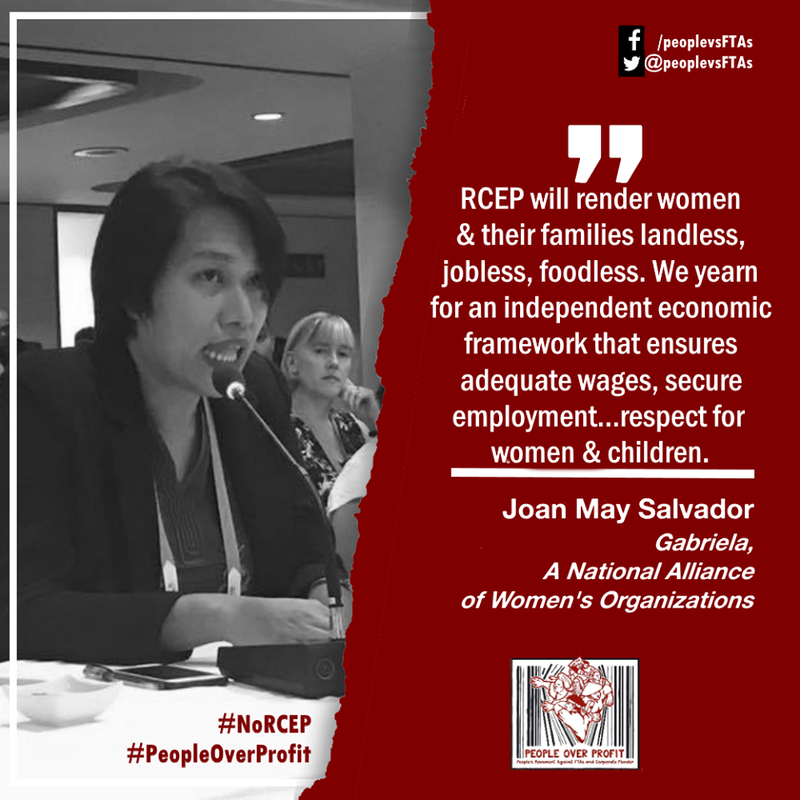 To women, the RCEP will further destroy our food security as governments will be pushed to buy surplus basic grain and re-orient local farm production towards palm oil, fiber, and other high value crops to feed the needs of upscale global markets. Foremost example of free trade rearing its ugly head is the chronic price spikes and constant shortage of rice, corn and other food staples for Asian consumers, and rice farms being converted to cash crops and real estate, which further contribute to displacement and hunger among farming families. To women, RCEP is the threat of more expensive medicine incarnate. Against a backdrop of an already privatized health care, women’s access to free and affordable medicines is all the more threatened, owing to the agreement’s reported provisions on intellectual property rights that will allow extended patents on important and life-saving medicines. To women, the RCEP will only render billions of women and our families landless, jobless, and foodless. The RCEP will only further marginalize women, treating us as mere fodder for corporate interests, subsuming people’s interests for the glory of profit-taking and development only for a few. Instead of an unfair trade agreement that is the RCEP, the women of the Philippines and other nations in the region yearn for an independent economic framework that ensures adequate wages, safe and secure employment, food security, environmental protection, respect for women and children, guarantees for which will be wiped out if we do not heed the voice of the people. Women want genuine empowerment, prosperity, independence and peace. For our sake and the sake of our children, women say NO to RCEP and other unfair trade agreements.